1968. Richard Nixon was elected president. Fighting raged in Vietnam with no end in sight. America watched "Hawaii Five-O," "Mayberry RFD," and "Here's Lucy" on an ever increasing number of color television sets. Robert Kennedy and Martin Luther King Jr. were assassinated. "Oliver" won the Oscar for Best Picture. Otis Redding was sittin' on the dock of the bay. And BMW introduced the 2002 in the United States. 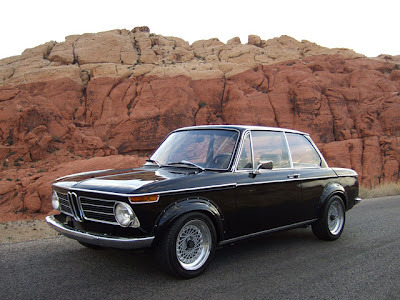 This fine specimen is a 1971 BMW 2002 tii that has been fully rehauled and redressed. This is a truely handsome car perfect for a gentlemen to sport. This has been on my holiday wish list for some time now. However, I've come to the realization that, living in NYC, one car is more than plenty. One day, this beauty will sit in my garage.